Nearly a million Maclaren strollers have been recalled as of Monday because of numerous reports of fingertips being amputated by a hinge mechanism. 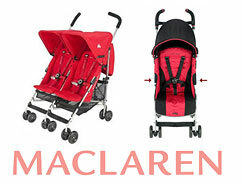 If you purchased a Maclaren stroller, stop using it immediately. Reports of over 12 children having their fingertips amputated by a hinge mechanism has prompted the manufacturer to recall all nine models of single and double umbrella Maclaren strollers sold around the country since 1999. Consumer Product Safety Commission announced the recall after an investigation. The company is offering free hinge covers which the company advises should not be removed unless the stroller is being cleaned. The list of stroller models includes: Volo, Triumph, Quest Sport, Quest Mod, Techno XT, TechnoXLR, Twin Triumph, Twin Techno and Easy Traveller.